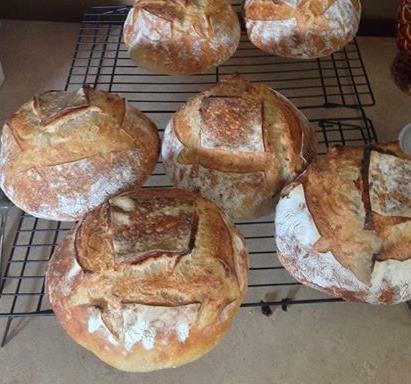 Photo Above: Matthew Peterson's homemade Adirondack sourdough bread. Yummy! What could make a fall, weekend evening in the ‘Dacks any better than just being here? How about a performance from our favorite group of thespians, paired with some fine food and drink. It’s the Farm to Table reception, which will proceed the ADK Shakes’ performance of Love's, Labour's Lost, that has got our taste buds a tingling. Organizers of the nosh up, on Saturday October 12 – Chef Shelby Davis and Schroon B&B co-owner Sharon Piper, have been doggedly rounding up local producers, food artisans, restaurateurs (who use local ingredients) and farmers, who will provide a smorgasbord of festive food and drink at the reception. We are happy to share with you a partial list of contributors: Mr. P’s Mountain Smokehouse and Shelby’s own Kitchen Therapy will be providing tastes of the smoking barbecue and gluten free treats. And local restaurants and farmers – it’s not too late to contribute – anything you’ve got will be appreciated. It’s a fine chance to showcase your business a taste of your fine menu items – so everyone benefits. So give Shelby a call on (518) 932-1241. And for those traveling from out of town, and a looking for a place to stay, please check out our advertisers, The Lake View Inn and The Schroon Lake Place.